WorldBound's Logo is inspired by the Pontremoli Labyrinth, a medieval stone relief that was originally placed in the Benedictine Abbey of St. Peter in Pontremoli, Italy. Pontremoli is a Tuscan town situated on the ancient Via Francigena, a pilgrim route leading to Rome and used in the Middle Ages by pilgrims coming from Northern Europe. The labyrinth in medieval times came to be used as a metaphor of life as pilgrimage, that is, a journey of transformation and discovery of self and the world. We believe this is what study abroad is meant to be. 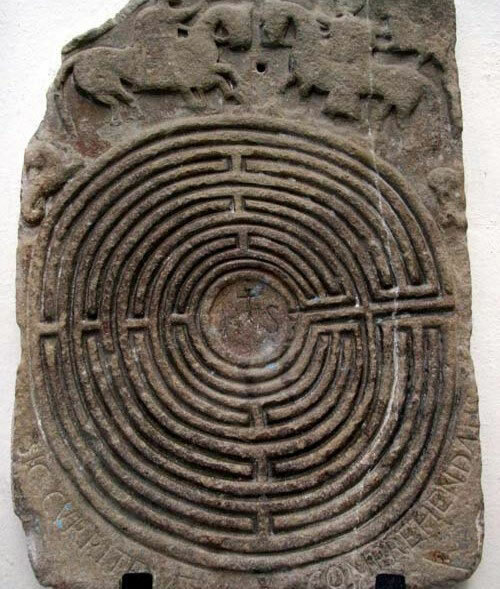 The inscription "Sic currite ut comprehendatis" is from the first letter of St. Paul to the Corinthians 9:24 and means "Run, so that you may obtain [the prize]", the prize being truth, represented in the middle of the labyrinth with the letters IHS, an abbreviation for Jesus. The Latin verb comprehendere literally means to grasp, both physically and intellectually. From these bases we can so paraphrase WorldBound's motto as "Tread the world, so that you may understand".